First vice president of the RBBB circus. 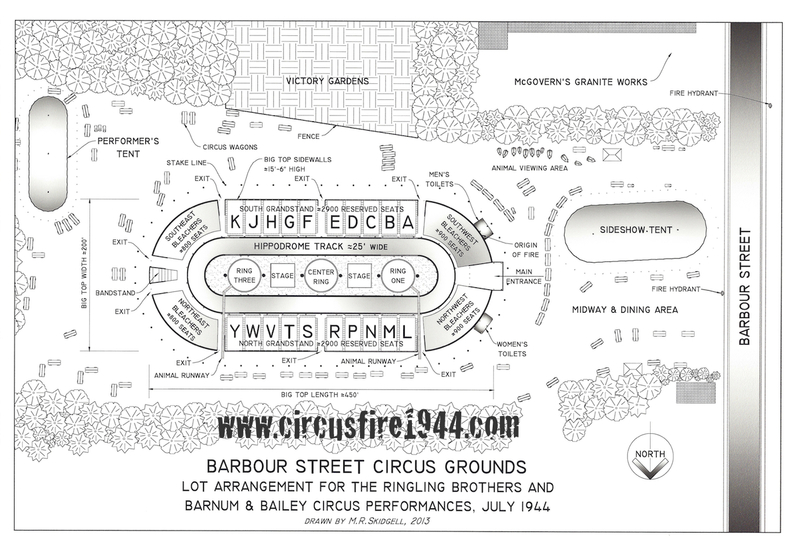 When he first heard of the fire, Haley was in the office wagon, outside of the big top to the left of the main entrance and behind the ticket wagons. He could look out of his office window and see the main entrance. When he heard people screaming, he looked out the office door and a quarter of the canvas roof had already been consumed by fire. Haley stayed on the grounds during the fire; shortly after the fire he went to the Bond Hotel and called RBBB president Robert Ringling in Chicago to tell him of the disaster. 9th-grader at Henry Barnard School, attended the circus with Anna Bottaro, and Santina and Concetta Giansiracusa, and the girls sat in the top row of seats in the Southwest Bleachers, about 2 board lengths from reserved seating Section A. The sidewall canvas behind her was lowered from the roof edge, and from her seat she could see camels, elephants and a donkey in the Menagerie area, and men cleaning the elephants outside the Big Top. During Mae Kovar's act in Ring One, Pearl looked out and saw smoke to the left of where she was sitting, but could not see where it was coming from. As the Wallendas were going up to start their act, Pearl looked up and to her left and saw the edge of the canvas roof on fire, toward the Main Entrance. She started down the bleachers, fell and got stuck, got up and reached the bottom and saw children being trampled on. Pearl went out the Main Entrance and saw men telling people to take their time. Outside of the tent, crowds of people were screaming and pushing, so she left the lot and went across Barbour Street, met up with friends and walked home. Pearl was treated by her doctor for an inured leg and burns to both arms, above the elbow. Attended circus with her sisters Nancy Hauschulz and Shirley (Hauschulz) Hunter, and niece Patricia Hunter. All would survive. The group had moved from the bleachers to an uncrowded seating section next to an exit and an animal runway. When they noticed the fire, they were able to step down onto the animal runway and then to the ground. Once outside, they turned to see the tent collapse. Read Arlene (Hauschulz) Carlson's full story here: Personal Accounts Page 6. Attended the circus with her sisters Arlene Hauschulz and Shirley (Hauschulz) Hunter, and niece Patricia Hunter. All would survive. Nancy's first husband would later be William Elliott, who lost his mother and brother in the fire. Read Arlene (Hauschulz) Carlson's full story here: Personal Accounts Page 6. Attended the circus with his mother, both survived. Read Dr. Harold Hazen's memory of the fire here: Personal Accounts Page 8. Was awarded $10,971.50 by the arbitration board for injuries received in the fire. Was awarded $400 by the arbitration board for injuries received in the fire, including burns on her arm and scalp, and nervous shock. Was awarded $400 by the arbitration board for injuries received in the fire, including 2nd degree burns to his left elbow. Attended circus with wife Eleanor and son Edwin A. Heck, all survived. Edwin J. helped others escape by cutting the canvas tent with a knife. Attended circus with husband Edwin J. and son Edwin A. Heck, all survived. Eleanor gave birth to son Robert Heck in the evening of July 6, 1944, following their escape from the fire. Attended circus with Jean Barker. They originally sat near the animal chutes then decided to move near the entrance for a better view. Both escaped. Was awarded $5,000 by the arbitration board for injuries received in the fire, including abrasions, contusions, and injuries to her ankle, hip, and buttocks, and nervousness, crying spells, irritability, insomnia, anxiety, and sensory disturbances of the skin. Mrs. Hershman jumped from the top of the bleachers with her 16-month-old son Allan held close to her body. She fell on her back and elbow. She was with an older woman companion, but lost her after getting out. Was awarded $18,600 by the arbitration board for injuries received in the fire, including broken heels and broken back. Mrs. Hilding jumped from the seats, landed on her heels and fell backward. Her grandson dragged her from danger. A soldier helped her to her feet but she couldn't walk, and was taken by ambulance to Municipal Hospital. She was transferred to Hartford Hospital where she remained until October 12, 1944. Went to the circus with his mother Mary Hindle, and grandmother Ada Hall Hindle. Ada would perish in the fire, while Edmund and Mary would survive. Went to circus with her son Edmund Hall Hindle and mother-in-law Ada Hall Hindle. Mary and Edmund survived, Ada died in the fire. Attended the circus with her daughter Shirley, and sat in the 4th row on the right side of the Southwest Bleachers, next to the reserved seating Section A. Dorothy saw the Wallendas getting in place to perform and she heard commotion. She turned and saw flames on the top of the canvas sidewall behind her. The flames appeared to be a horizontal line of flame, 15-feet across, and about 1-foot from the top of the sidewall where it meets the edge of the canvas roof. Shirley left immediately, while Dorothy stumbled down the bleachers and joined the heavy crowd of people walking out the Main Entrance. Outside, she saw circus employees leading elephants and camels from Menagerie area out to Barbour Street. When she reached the Midway area, she turned and the Big Top seemed to be just black smoke and flames. She reunited with her daughter and they walked to the city. Went to the circus with her mother, Dorothy, and sat in the 4th row from the ground in the Southwest Bleachers, near reserved seating Section A. Shirley heard screams and turned to see a large sheet of flame directly behind her, on the canvas sidewall above the heads of the people in the top row of the bleacher seats. She ran out the Main Entrance and waited outside for her mother. May have attended the circus with victim Margaret Garrison. 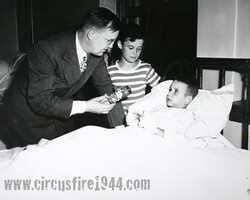 Mayor Mortensen and Donald MacRae (center) visit Robert S. Hopkins, Jr. at St. Francis Hospital after the circus fire. Firefighter with HFD Company 2, one of the first on scene and helped carry women and children to safety. Also helped bring the dead to the morgue. Was awarded $750 by the arbitration board for injuries received in the fire, including 1st and 2nd degree burns on his arms, nervousness, and shock. Attended the circus with his wife, Florence Hoyt. Was awarded $1,500 by the arbitration board for injuries received in the fire, including 1st and 2nd degree burns to her arms, nose, and top of her head, and nervous shock. Had been reported missing, was found uninjured. Attended the circus with her mother Shirley (Hausculz) Hunter, and aunts Arlene and Nancy Hausculz. All would survive. Read Arlene (Hauschulz) Carlson's full story here: Personal Accounts Page 6. Attended the circus with her sisters Arlene and Nancy Hauschulz and daughter Patricia Hunter. All would survive. Read Arlene (Hauschulz) Carlson's full story here: Personal Accounts Page 6. Attended circus with friends Jean Andrews and Constance Carlton, who also survived the fire. The girls were seated high on the bleachers when the fire broke out, and all prepared to jump except Maxine, who froze. Constance delivered a hard slap to the face of Maxine, and they all jumped to safety. Maxine's brother Richard Huntington is also a survivor of the fire. Brother of Maxine Huntington, who also survived the fire, Richard helped to carry injured and dead and loading them into trucks. He went to the morgue to try to identify his missing sister, who survived the fire but was lost in the surrounding woods with her friends after escaping the burning tent.